Well, it was bound to happen after twenty years of skiing. I'm a freestyle skier, which means I spend most of my day at the mountain hitting jumps and rails. While at my local mountain for a half day session, I was messing around on this small jump doing 360s and 540s, just playing around. At about 11:30am, I spun a 360 and landed slightly right and had to correct so I didn't hit the trees, and when I did this, my left knee kicked out and twisted, and I heard 3 loud pops then my ski released. I have never felt a pain so intense in my life (and I have separated my shoulder and shattered my ankle). After about 2 minutes screaming alone , someone who saw me fall came over and got some people to get ski patrol. Thankfully I knew the patroller and they joked with me a bit, and got me to the bottom (on the "dead sled", which was slightly embarrassing). I was hoping for a broken leg, but 3 of the patrollers had the same injury and could tell that my ACL was torn. I went to the ER and they found that my ACL, MCL and a patella ligament were torn. 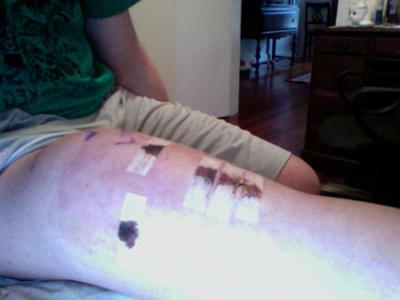 I decided to go with the hamstring tendon graft from my left leg for reconstruction. I had my surgery on March 24th and found that the first week wasn't too bad and I had a lot of gains that week. But since that week, I have had difficulties sleeping and cannot completely extend my leg, so I walk with a pretty severe limp. I am able to walk around short distances without crutches and can bend my knee to past 90 degrees. I am starting physical therapy on April 14th, but until then I have been doing the towel roll, quad sets and leg lifts to strengthen my knee. The worst part about this surgery is keeping the leg elevated, which is pretty impossible unless you enjoy basically being almost upside down all the time, and doing the extension exercises (my knee shouldn't bend that far backwards, especially for 20 minutes every 4 hours). I have found this website useful because its pretty in depth and gives me ideas about what to expect in coming months, and has actually helped me more than the information given to me by my orthopedic. I figured I would share my story with others because this surgery is a pretty big deal and I am hoping to be ready for next season!